Usually I'll put my disclosure at the end of a review, but this time I'm going to start with it. Ann Martin's All Things Paper blog is a favorite, because she loves paper even more than I do! She links to some incredibly awesome things you wouldn't believe are made from paper, she's a quilling enthusiast who shares her love and some great projects, and it's one of the most inspiring blogs out there. So when she wrote to me to ask if I'd like to review this book for GoodReads, I went kind of fan girl. Ok, REALLY fan girl. Took me a full ten minutes to answer YES! and much of that time was spent trying to compose an answer that wouldn't make her decide I was a crazy craft stalker. 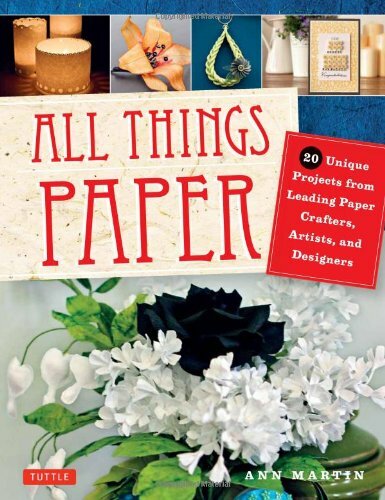 All Things Paper is a book of paper crafts by various artists that is curated by an expert in the field. Ann Martin is enthusiastic about paper, and it shows. These are 20 projects that truly showcase the range of paper as a material for artists and crafters to create things. From realistic paper flowers to beautifully bound books, this book is a fantastic collection. There are all sorts of paper used in the projects shown. Some are upcycled from things you have around your house already, others use specialty papers. Paper is very affordable, and most of the projects in the book can be tried and practiced with plain paper before you cut into the more expensive sheets. The instructions are all very clear, with lots of photos of the steps to illustrate. The photos are well done and well lit. The projects are separated by use. Home Decor covers projects that are used in the home, such as simple to make and elegant luminaries, realistic lilacs, a Japanese inspired stationery box ,a silhouette portrait and a few others. My favorite project in this chapter, surprisingly isn't the stationery box, which is gorgeous and a practical gift; but the silhouette art because of the way it combines with a pretty cut paper background to make a truly frameable personal piece of art. Fashion Accessories surprisingly only has two projects, but that's only because Jewelry is another chapter! Between the two chapters, you'll see a tote bag, a Tiger Lily fascinator, some gorgeous quilled pieces by Ann Martin, and learn a new technique for creating something almost like paper mache but stronger that can be braided and shaped. My favorite project in these two chapters is easily the Antique Key Pendant because the basic idea key design lends itself to all sorts of adaptations to make a very special pendant. Correspondence is the stationery chapter, and this includes cards of course. There are also instructions for a neat journal project that would be a good gift for anyone. The cards are miniature works of art, and frameable. I love the clear and concise instructions with a lot of photos for making a journal, and my favorite card is hard to choose. There is the very elegant cut out paper tree card, but there is also a fun and colorful 3d flower card. At the end is great gallery, and also information and websites for all of the contributors to this great collection. I really recommend this book for paper enthusiasts, especially for beginners and intermediate crafters. You can get it at Amazon, and using my affiliate links helps pay for this site and my book addiction.